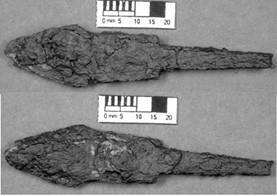 These are the post-conservation images of a tanged arrow that was in the process of being manufactured. This morphology for an arrowhead of Scandinavian origin. 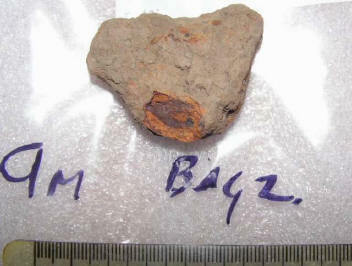 The iron was stored for several years in airtight bins and silica gel was packed into a tube (Right in this image) to slowly extract the moisture. The blue stripped was checked every few months to see if the gel needed drying. These are examples of conserved iron working tools on display in the Northampton museum. It is not possible to date iron. 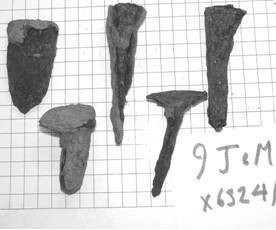 The samples found at Fulford are similar to tools found in other museums. 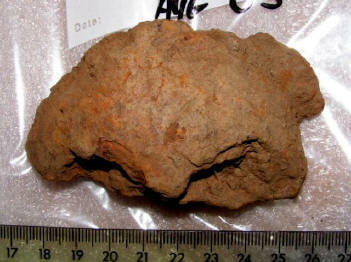 But the item (right) is believed to be an anvil. We found 5 and they look like big nails. They were driven into a block of wood and the top surface was used to beat the metal.